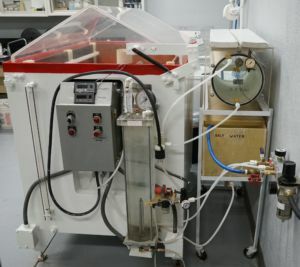 Stolk Lab, Inc. provides environmental testing services per ASTM guidelines to measure the performance of products and equipment under particular environmental conditions. We test metals, plastics, paint, adhesives, fabrics and many other types of materials to ensure sustainability in conditions of low to high temperatures, UV sunlight, wet environment, humidity, and salt water. Environmental and corrosion testing can be a useful tool in the process of failure analysis. This testing allows us to uncover faults and potential modes of failure on products prior to them hitting the production line and going into the field as well as post production. 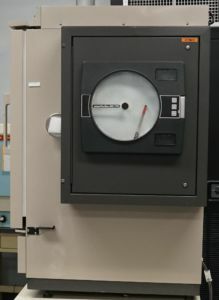 Different types of temperature and humidity testing help determine how materials, products and their components respond in environments of extremely high or low temperatures as well as settings of fluctuating humidity. Climate change can cause mechanical failures, sealant or package (water tightness) failures, optical failures, coating deterioration and more. 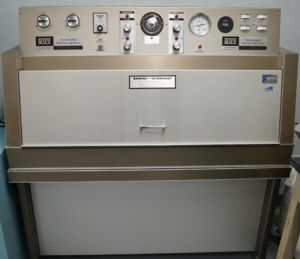 Our high and low temperature testing cabinets and ovens as well as our humidity chambers produce precisely controlled conditions of temperature and humidity. Our Accelerated Weather Tester simulates the effects of sunlight using fluorescent UV lamps as well as dew and rain with condensing humidity and water spray. UV light is present in sunlight and intermittent or prolonged exposure can cause materials to crack or disintegrate if they are not UV-stable. UV radiation exposure can cause gloss and color to fade as well. UV testing exposes products and components to ultraviolet radiation in a controlled environment. The conditions simulate months or even years of exposure and allow measurements to be taken at different exposure levels for visual understanding of the significant differences. 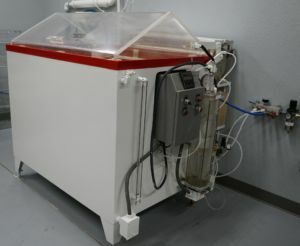 Our Accelerated Corrosion Test Chamber can be used for Salt Spray/Salt Fog, CASS, Humidity, Water Fog and many other tests. Salt spray testing is a popular environmental corrosion test method that creates environments of water with a high concentration of dissolved salts to measure the corrosion resistance of products, paints and surface coatings over an extended period of time. Samples are checked at specific intervals to observe and record corrosion development. Stolk Labs offers detailed reports, including photo documentation, of this environmental corrosion testing procedure. Our photos provide visual documentation of white and red rust development as well as coating degeneration. Performance testing in rigorous environments is a great method to ensure your product, material and components will function to capacity. Stolk Labs understands the need for products to be safe and dependable. We work directly with our clients to help ensure product quality and reliability. Give us a call and let us help you today.